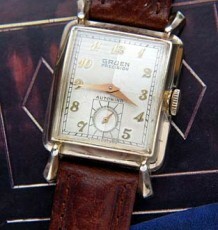 A war time vintage Rolex produced during the 1940’s. Many of these watches were given as presents to troops heading overseas. This is a 1940’s Canadian market Rolex produced with the now famous word Oyster instead of Rolex on the dial. This model is the Raleigh but is one of a series of names including Corvette, Hurricane, Pioneer, Grenfell, Lincoln and others. This watch has the unmistakable Rolex minute chapter and dial configuration as the other Canadian Oysters of the 1930’s and 1940’s. The split Swiss Made script in that delicate font is the surest sign this dial is all original. 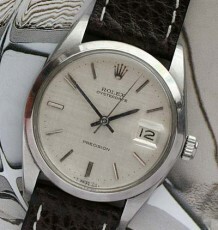 This vintage Rolex dial feature luminous Arabic numerals with the correct luminous pointed hands. 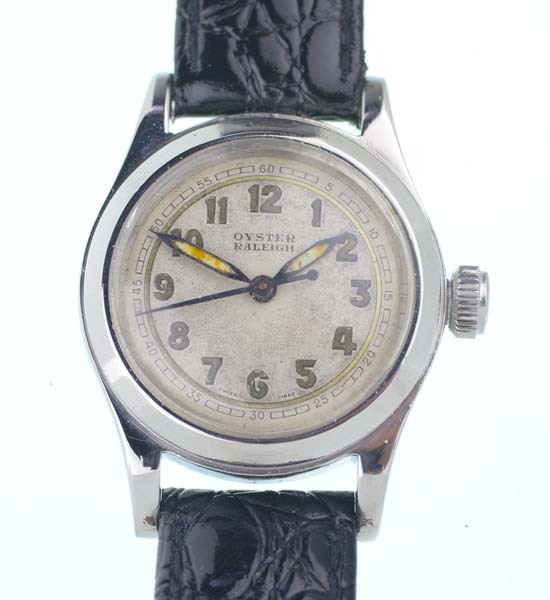 The steel Oyster case is signed Oyster Watch Company and carries the reference number 3136 with a serial number dating it to 1941. Please note the original Oyster Patent crown, which screws down tightly to the tube. The 15 jewel manual wind movement fitted in the watch is the same non shock resisting calibre 59 movement found in all the other Canadian Oysters of the period, some are signed Oyster Watch Ltd on one of the rear plates of the movement. 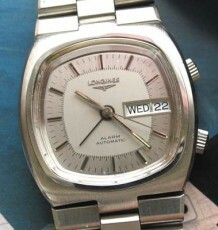 Other like this one have the signature, Rolex Geneve, under the dial. 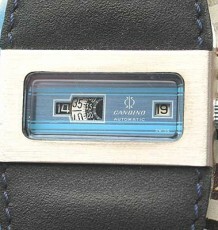 The case measures 30.5 mm wide by 40 mm long and is supplied on a choice of black or brown leather strap.